When an employee is chronically late, this termination letter can serve to outline the reasons they are being fired. 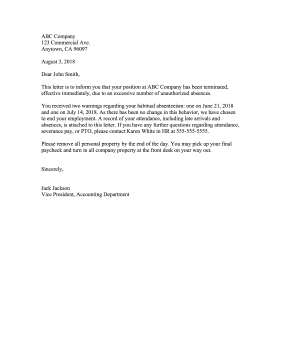 This letter is to inform you that your position at ABC Company has been terminated, effective immediately, due to an excessive number of unauthorized absences. You received two warnings regarding your habitual absenteeism: one on June 21, 2018 and one on July 14, 2018. As there has been no change in this behavior, we have chosen to end your employment. A record of your attendance, including late arrivals and absences, is attached to this letter. If you have any further questions regarding attendance, severance pay, or PTO, please contact Karen White in HR at 555-555-5555. Please remove all personal property by the end of the day. You may pick up your final paycheck and turn in all company property at the front desk on your way out.